This glamorous little 53m² apartment feels a bit like the set of an old Hollywood film set. There are wall-to-wall glimmering mirrors, a sumptuous collection of fabrics and furnishings and an extremely subdued and sophisticated colour scheme. 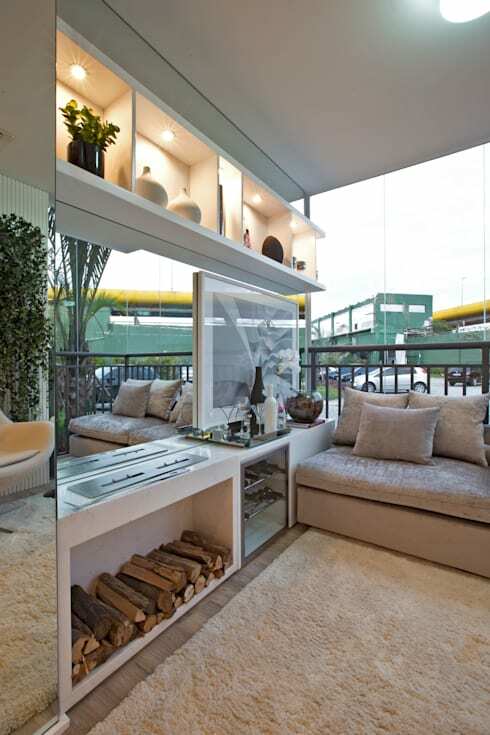 This is one small home that shows how to create an atmosphere of luxury in the smallest of spaces. The home interior is furnished in large swathes of pastel colours with a variety of textures. The light colour scheme makes the small home feel large and the textures give it that all-important sense of cosiness and comfort. The main traffic zones are left uncluttered and there are relatively few items of furniture. In all, this is a small apartment with a sense of refinement and luxury. 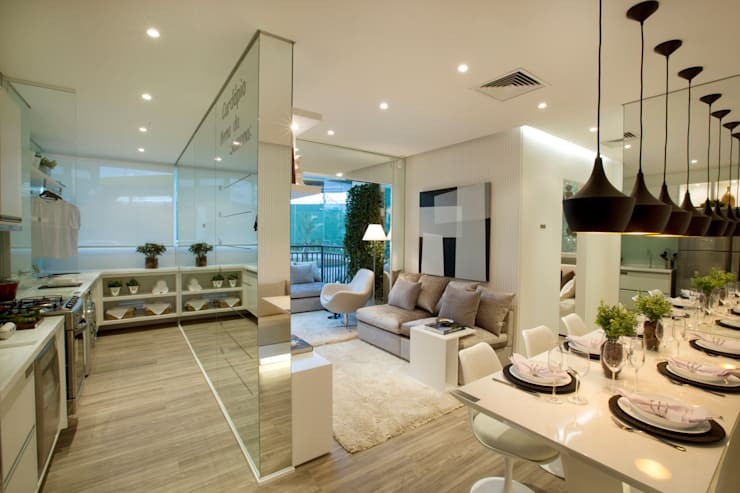 The interior architects have taken full advantage of the power of mirrors throughout the home. 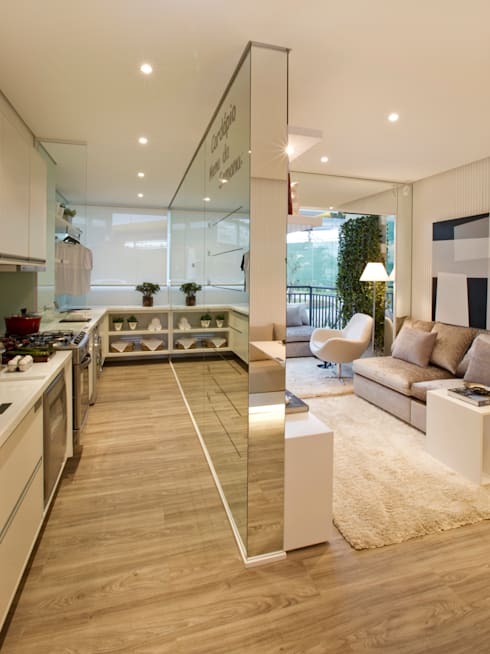 It's quite risky to use a mirrored dividing wall in an open plan living area. Obviously it reflects every little object so it could easily make a room feel cluttered. But thankfully, the walls are relatively clear and beautifully decorated with fine artwork. The kitchen has a gleaming, minimalist ambiance. 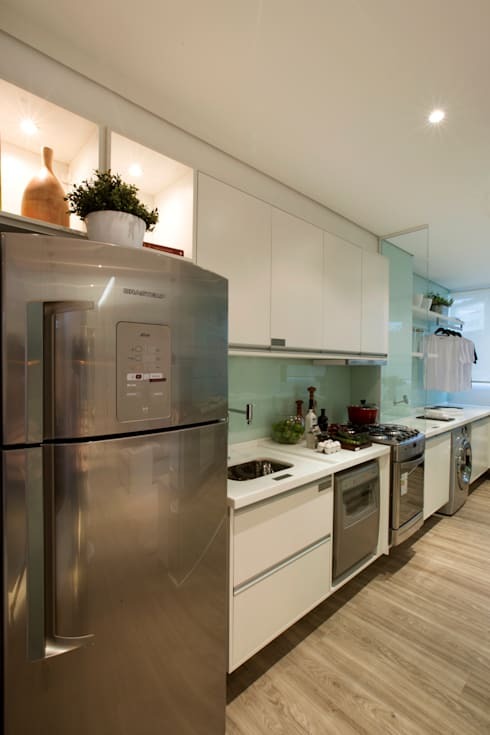 Stainless steel appliances reflect light and suit the glossy veneer of the pale green glass splashback. It's interesting to see how the base kitchen cupboards have been raised off the ground. This tiny sliver of space is often used to make a small room feel large. Also, note the laundry area to the far right. It's separated by a small glass partition. We have more photos of this later on. First impressions count when it comes to entertaining. And although this dining room is small, it certainly has a lot of style. It seats 6-7 people and exudes a sense of formality. The best part about this dining area design is the clever use of space. The corner of the room has been well used with bench style seating. A bright light under the bench creates a light, elevated effect and finally, the round white chairs without armrests can easily be tucked under the table. We love the striking pendant lights too. They give the dining area distinctive and create a sort of psychological boundary around the space. The small bedroom and standard sized window are of modest proportions. But the creamy sleeping area has an undeniable luxurious feel. Much of this has to do with the clever use of fabric and mirrors. The curtains run all the way from the ceiling to the floor and make the window feel much larger than it actually is. 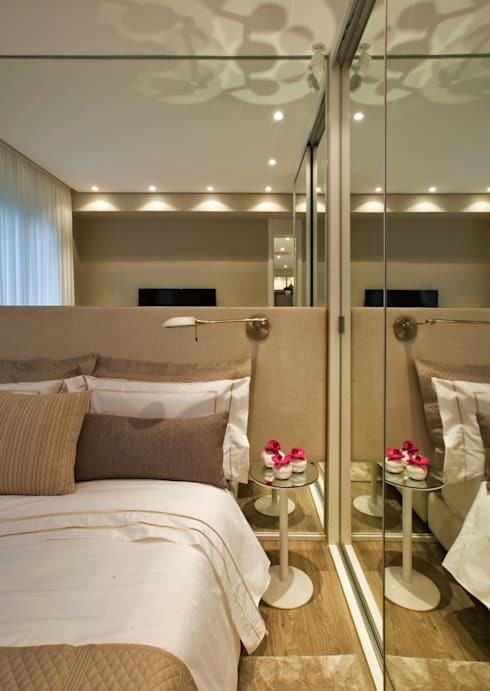 The bedroom headboard runs from corner to corner and this accentuates the effect. 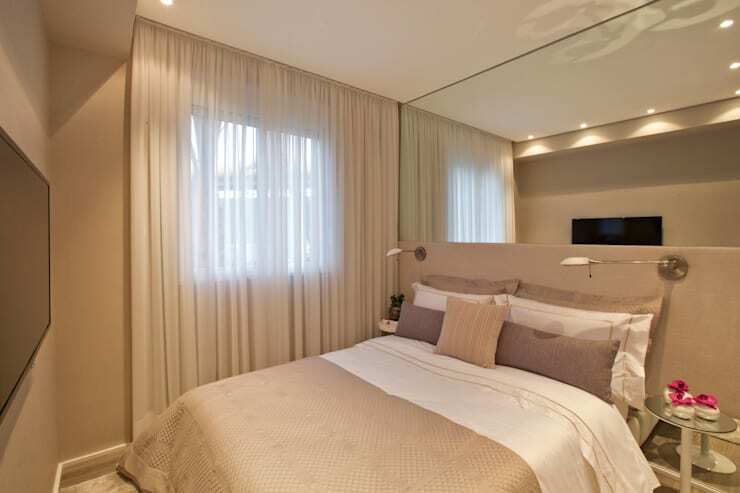 Finally, the bed linens and fabrics are all of a subdued and similar tone. 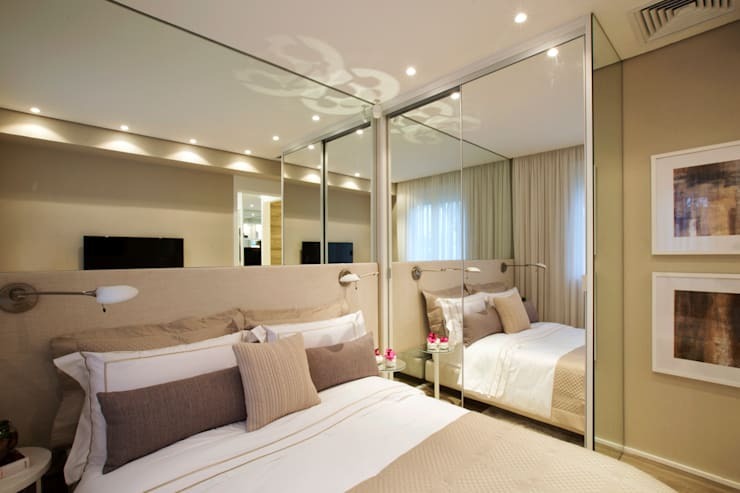 It's a bedroom that feels a little bit like a small, but luxurious hotel suite. There is a lot to love about the balcony or terrace. It's been enclosed in glass so the climate can be properly controlled. 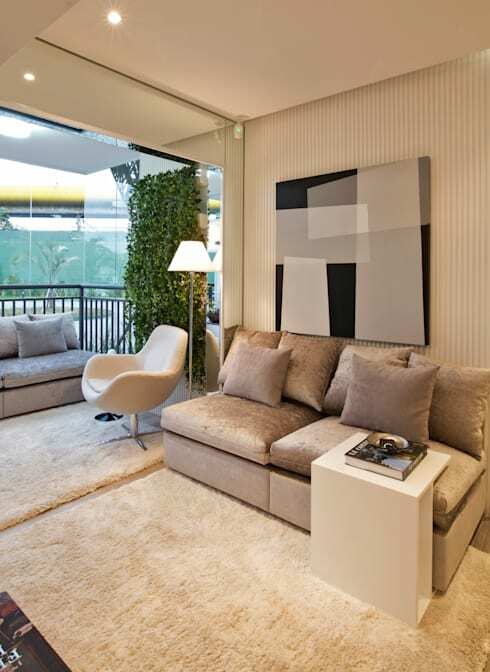 This allowed the designers to indulge in some indoor seating and a big creamy rug. Decorative lights and mirrors tie it in with the rest of the decor. In the mirror, we can see a glimpse of the wall garden too. Finally, have a look at the small bar fridge and sophisticated little grill. 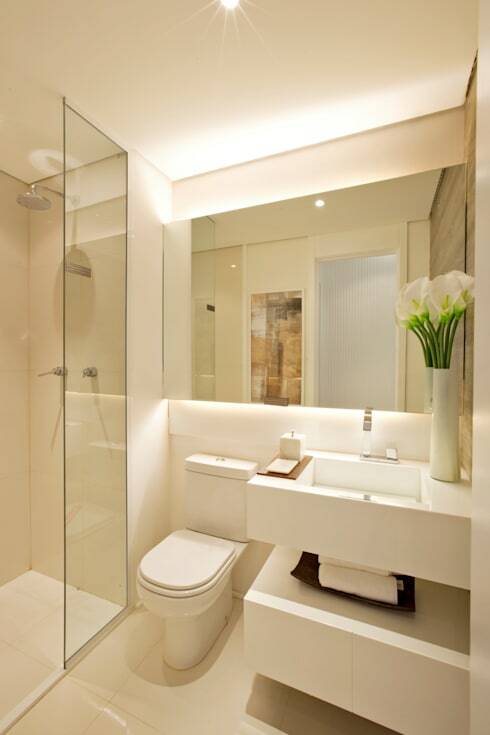 The small white bathroom has a translucent shower screen and a shower room design. A wall mounted wash basin and cabinet makes the small bathroom feel light. Finally, the subdued bathroom lighting has been installed behind a large wall to wall mirror. 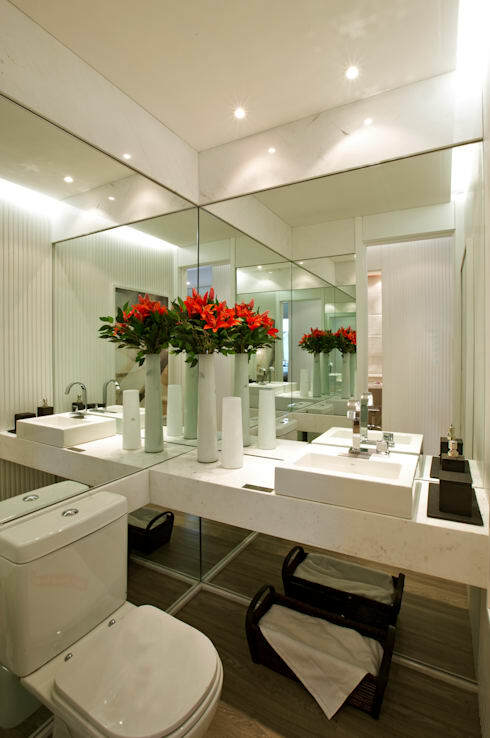 It's the perfect little bathroom for a perfectly glamorous home. 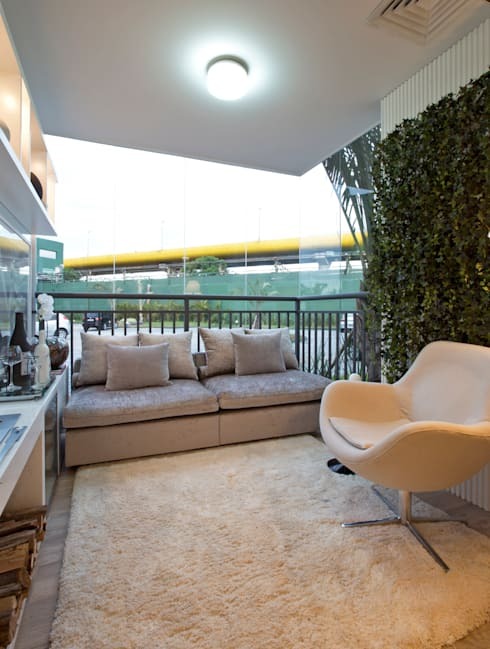 Some readers may have recognised the trademark Brazilian decadence in this apartment, for more multicultural offerings, spoil yourself with A look inside 4 apartments from 4 different cities. What's your favourite feature in this luxurious apartment?